The Dialectical Behavior Therapy Skills Workbook for Anxiety adapts the powerful dialectical behavior therapy (DBT) program for the treatment of anxiety and anxiety-related conditions. DBT offers a set of skills for managing emotional distress that are useful for all people, but can be especially beneficial for anxiety sufferers who are prone to panic attacks, exaggerated worries and fears, and obsessive and compulsive behaviors. This Workbook presents a DBT-based program for overcoming anxiety that helps readers discover and apply the core DBT skills, practice developing assertiveness, and learn to deal with conflict and anxiety-provoking situations. "The Dialectical Behavior Therapy Skills Workbook for Anxiety is concise, well organized, easy to read, and will likely be a lifeline of relief for many people. Chapman, Gratz, and Tull do a marvelous job of detailing the specific tools of DBT that can truly help readers to help themselves become more positive, able to cope, and successful in their relationships." 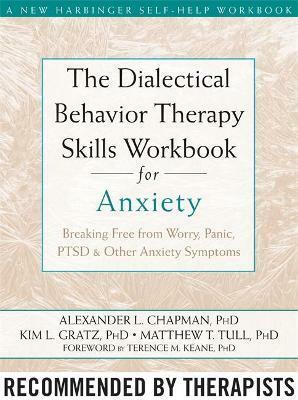 --Denise D. Davis, PhD, clinical psychologist and founding fellow of the Academy of Cognitive Therapy "Alexander Chapman and his colleagues have provided a much-needed, thorough resource in The Dialectical Behavior Therapy Skills Workbook for Anxiety. Offering DBT skills and emphasizing mindfulness practice, this book provides helpful information and practical worksheets, and will be a valuable tool for both people experiencing anxiety and the clinicians treating them." --Sheri Van Dijk, MSW, RSW, psychotherapist in Ontario, Canada, and author of The Dialectical Behavior Therapy Skills Workbook for Bipolar Disorder "This is an excellent application of dialectical behavior therapy (DBT) skills for people struggling with anxiety, panic attacks, and related problems. Not only will readers gain a better understanding of what these problems are, they'll also learn some very practical and effective skills to cope with them. Many thanks to the authors for bringing the success of DBT to people suffering with anxiety." --John Forsyth, PhD, director of the Anxiety Disorders Research Program at the University at Albany, SUNY and author of The Mindfulness and Acceptance Workbook for Anxiety "For many, the struggle to control anxiety can be an exhausting, consuming, and seemingly endless challenge. Fortunately, The Dialectical Behavior Therapy Skills Workbook for Anxiety offers a number of well researched, easy to implement strategies that can help readers to better understand, accept, and manage their anxiety, improve their relationships, and engage more fully in their lives." --Susan M. Orsillo, PhD, psychology professor at Suffolk University "A clear, practical guide that combines evidence-based approaches with rich clinical wisdom. Filled with innovative and practical advice as well as lively metaphors and engaging case examples, this book is sure to help readers struggling with anxiety find a balance between acceptance and change. I highly recommend this book and these authors." --Lizabeth Roemer, PhD, coauthor of The Mindful Way Through Anxiety "I strongly recommend this self-help book for people suffering from various forms of anxiety. These authors effectively describe in lay terms how mindfulness, distress tolerance, emotion regulation and interpersonal effectiveness skills augment the more traditional applications of cognitive behavioral therapy strategies in the treatment of anxiety. In this book, the reader will find clinical vignettes, diagrams, and useful worksheets in this book that enhance the process of learning of these DBT tools." --Alec L. Miller, PsyD, professor of clinical psychiatry and behavioral sciences at Albert Einstein College of Medicine in Bronx, NY "Increasingly, research is showing that dialectical behavior therapy (DBT) can be a useful treatment for a range of mental health problems. In The Dialectical Behavior Therapy Skills Workbook for Anxiety, Chapman, Gratz and Tull strip away the jargon and walk the reader step-by-step through this treatment, showing the reader how to apply DBT skills to anxiety. This workbook will provide many anxiety sufferers with much-needed relief." --David F. Tolin, PhD, ABPP, director of the Anxiety Disorders Center at the Institute of Living and author of Face Your Fears "To be relieved of anxiety is often a person's highest priority for therapy. This book allows access to the powerful DBT methods that that can provide that relief. It is not always possible to join a DBT skills training group, but it is possible to understand and use Marsha Linehan's transformative work by reading this practical interpretation." --Kate Northcott, MA, MFT, DBT therapist in private practice with Mindfulness Therapy Associates and director of New Perspectives Center for Counseling in San Francisco, CA "Symptoms of anxiety, worry, and panic are integral to the emotional disorders and respond to a core set of psychological interventions. In this outstanding workbook, the authors pull together some of the most creative and scientifically-proven procedures for managing out-of-control emotions, including anxiety. These dialectical behavior therapy skills should benefit everyone suffering the ravages of anxiety disorders." Alexander L. Chapman, PhD, has published numerous articles and chapters on dialectical behavior therapy (DBT). In 2007, Chapman received a Young Investigator's Award from the National Education Alliance for Borderline Personality Disorder. Kim L. Gratz, PhD has written numerous journal articles and book chapters on borderline personality disorder, deliberate self-harm, and emotion regulation, and is coauthor of The Borderline Personality Disorder Survival Guide and Freedom from Self-Harm. Matthew T. Tull, PhD he has published numerous articles and chapters on emotion regulation and anxiety disorders, with a particular emphasis on panic disorder, generalized anxiety disorder, and post-traumatic stress disorder. Alexander Chapman lives in Port Moody, BC, Canada. Kim Gratz and Matthew Tull live in Jackson, MS.